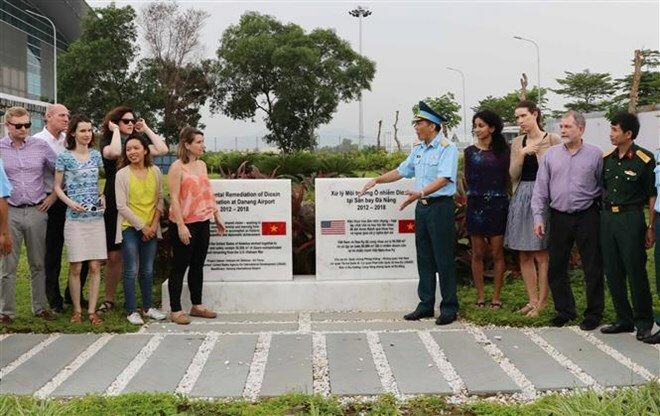 Da Nang (VNA) – A delegation of the United States legislative assistants led by Terra Lynn Sabag, Deputy Chief of Staff for US Congressman Rick Larsen, visited the location of a dioxin remediation project in Da Nang airport in the central city of the same name on April 17. Major General Bui Anh Chung, Deputy Commander of the Air Defence-Air Force Command, informed his guests on the results of the project. The project was launched in June 2011, with core activities comprising of clearing of bombs and explosives. The six-year project to remediate the environmental pollution at the airport was jointly implemented by the Vietnamese Ministry of National Defence and the US International Development Agency (USAID) with a non-refundable aid of 110 million USD funded by the US Government. After the second phase wrapped up in November last year, it successfully detoxified over 90,000 cubic metres of toxic sediments by the thermal treatment method, while isolating other 50,000 cubic metres of low-contaminated sediments. Nearly 30 hectares of land have been remediated to improve and expand Da Nang airport, thereby serving the city’s socio-economic development and the central and Central Highlands regions.